Madurai: Demonetisation has led to an unprecedented cash crunch in the country as people can either be seen lining up outside ATMs to withdraw cash or standing outside banks to get new currency notes, while those who can have switched to doing most of their transactions without cash. While e-payment and card payment saw a rise in the past few weeks following demonetisation, one individual decided to take things to a new level when He/she couldn’t find Rs 5 change to pay at a public toilet, as she wrote a cheque for Rs 5. 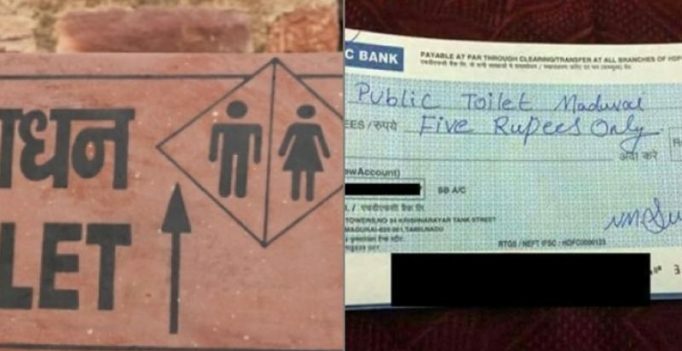 The cheque written by a person in Madurai had ‘Public Toilet Madurai’ written on it, and was shared on Facebook by a user BRM Muralidharan, who mentioned it as a sign of country moving towards a cashless economy.